Oilskin is a heavy cloth that has been made waterproof by being impregnated with a hot solution of oil, gum, and wax to ensure maximum protection under extreme conditions. It has traditionally been made into the foul-weather apparel worn by sailors and fishermen. Like many pieces of outerwear, the oilskin was born out of necessity. Life upon the high seas was never easy for those on board ship, and sailors devised a number of protective garments to deal with extreme conditions. During the early nineteenth century, it became common for sailors to smear themselves and the clothes they were wearing with oil for protection from the cold and the continuous ocean spray. One sailor at the time, Edward Le Roy, discovered that worn-out sail canvas could be recycled as outerwear. He devised a method of painting the fabric with a mix of linseed oil and wax so that it would become waterproof and suitable to be worn on deck in foul-weather conditions. By the 1830s, the oilskin had become established as essential attire for rough weather at sea for sailors, fishermen, and lifeboat men. The oilskins appeared to have a yellowish hue owing to the linseed oil used to treat them. Overcoats, hats, jackets, and trousers were also produced in this manner. When sailors came to shore they would often still be sporting their oil-skin attire, and the wearing of oilskins was adapted for use by people on land. As news of the effectiveness of Le Roy's new discovery spread, oilskin coats were soon being made by colonists in Australia, and by members of the British army to protect their rifles during rainstorms. The oilskin coat is often known as a "slicker" in the United States. 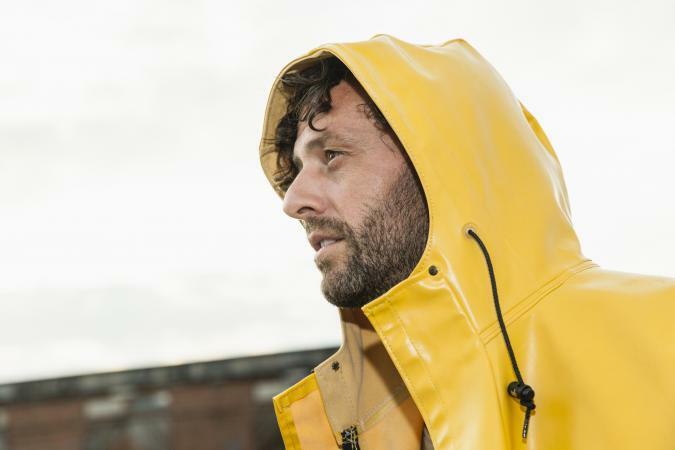 Oilskin coats and trousers, now made of rubberized or plastic-coated fabric, are still widely worn by fishermen and those in other maritime occupations, and have become standard rainwear for young children. They typically are made in a bright yellow color, echoing the original linseed-oil hue of oilskin itself. Cattle drovers in Australia developed a version with a fantail to protect the seat of the saddle and leg straps to prevent the coat billowing out or blowing off while riding in the harsh conditions of the outback. The coat, that would become known as the Driza-Bone (the name recalls the dried-out bones of animals often found in the deserts of the outback) also had extended sleeves to protect the wearer's arms when they were extended. Oilskins of this style are still worn by motorcyclists, fishermen, and water-sports enthusiasts alike; the Driza-Bone has become one of the iconic garments of Australia. The Barbour is another version of an oiled and waxed jacket, the use of which has filtered through to the mainstream. Established in 1894, the Barbour Company's eponymous lightweight coats have become a byword for traditional British oilskins. Ideal for walking, yachting, and fishing, Barbours come in three different weights. The Barbour has also become synonymous with agriculture, owing to its durablity, functionality, and most importantly, its warmth and protection from the rain. Not only do oilskins work as functional pieces of outerwear, they also look as good with a pair of jeans and loafers as they do with working overalls, heavy-duty boots and other protective dress. De Marley, Diana. Fashion For Men: An Illustrated History. London: B.T. Batsford, 1989. Wilkins, Christobel. The Story of Occupational Costume. Poole, Dorset: Blandford Press, 1982.